Growing at a third of the rate of its parent 'Skylands', this gleaming gem appears to have the sun shining on it all the time. 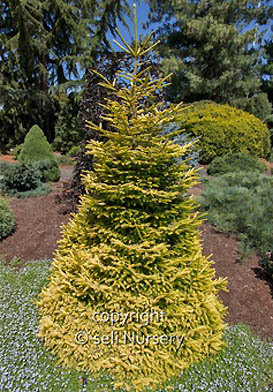 Bright yellow new growth mutes to gold for the remainder of the season contrasting nicely with the dark green interior needles. Staying dense from top to bottom, it's a great addition to smaller landscapes. Very uniform in growth; neat and tidy.